Welcome to St Botolph's Church of England Primary School! I am so proud of our school, staff, children, parents and governors. All our stakeholders work hard to support and look after each other. This makes our school a special place to be. Come and visit us and see for yourselves. We have a dedicated staff, who work hard to meet the needs of all the children. It is important to us that the children learn and enjoy coming to school. You will always receive a warm welcome when you come to our school, the staff and children are always pleased to see new faces. Our school environment is vibrate and warm and immerses the children straight into their learning. The children are given many opportunities during their journey with us, from residential trips to visitors and Wow Days! This is where the children dress up and the parents come in to share their work with them. The children enjoy their learning and this can be seen throughout the school. We hope that you enjoy your visit to our website, and that you find all the information you are looking for. Please feel free to leave comments in the Guestbook, or contact the school direct with any queries you may have. My door is always open and I am more than happy to spend time with anybody who wishes to know more about our wonderful school. Paper copies of any information on the school's website are available on request. St Botolph’s CE Primary is a welcoming, happy and forward thinking school. The development of immersive learning and exciting challenges in a vibrant environment will prepare our children for a rapidly changing world by making them independent learners. Through the opportunities that we provide we aim to encourage our pupils to be critical thinkers, with global perspective and respect for others. Through our commitment to Christian values and secure relationships we will nurture, support and empower each other. All our children will have success today and be prepared for tomorrow. 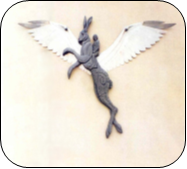 You might have noticed the hare that is on the front of the school building. The school was built on a piece of land where the hares use to play and live. The hare represents the past and future of the school coming together. The hares may not live here any more but, they are all now on a magical journey with the children here at St Botolph's. Exploring and learning together in harmony. A topic-based curriculum has been designed to meet with the expectations of the National Curriculum, introduced in England in 2014. The topics, skills and exciting learning opportunities have been chosen to stimulate, engage and inspire our pupils. This is in line with our Teaching and Learning Policy (2016). Our curriculum has been designed with our pupils in mind. Each year group has topics set to engage all children, but particularly our boys whose results in reading and writing are lower than our girls. The impact that the curriculum has on our children’s learning will be learned in the data and pupil progress meetings and regular intervals during the school year. Before the beginning of each academic year, the year group teaching teams are provided with their curriculum folders. These folders outline the expectations and curriculum links for each of the topics that are to be covered in the year. Then, the creativity can begin. The teaching teams can then plan and design lessons and activities to meet the needs of their class. In terms of monitoring, each class teacher has been provided with the skills and coverage of the National Curriculum. This will be annotated through the year, thinking about what works and what could be improved. During term 5, the Curriculum coordinator will look at this information and adapt and change where necessary. In addition to this, questionnaires will be devised for the children and the learning practitioners to understand and gain their views and opinions. The impact of our curriculum will also be seen in our learning environments, Project Books and the children’s attitude to learning. Medium Term Plans- an overview of the skills that will be covered are found in each topic booklet (see below). Short term plans- how the learning objectives and skills will be taught. St.Botolph’s curriculum has been written with a topic-based, cross-curricular approach. Each topic for every year group will have an outline of coverage, laid out in a booklet. This is used as our medium term plan. Literacy links- including books and films that could be used to inspire. Enrichment opportunities- including potential ‘Wow’ Days, trips, the learning environment and parental involvement. How our values are promoted within the topic- Including SMSC, British and Christian Value links. Convention Right to the Child- how are rights are embedded within the learning. Once the year has ended and the class teachers have evaluated the effectiveness of the curriculum, this information is passed onto the next year group. There may be areas of the curriculum where objectives have not been met due to time limitations or ability of the children, so these are highlighted for the next class teachers to take into account. With regard to all subjects in transitioning to the next year group, children’s abilities are shared with the next class teacher. This ensures a smooth transition in learning as differentiation needs can be met. A proforma for this is supplied.